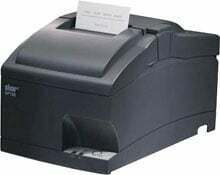 Star SP742 - Impact Dot Matrix, USB Interface, with Auto-cutter and Internal Universal Power supply, Color: Gray. Cable not included. See accessories. Also known as SP742MU GRY US. The Star SP700 combines ease of use, high speed, reliability, a tear bar and a compact footprint to provide a value-driven solution. The SP700 is a printer made of a proven technology (Impact Dot matrix) with all the tools that allow you to use it with the latest PC hardware and still using legacy POS software. The SP700 features a swappable communication interface that allows you to upgrade the printer at any time to support USB or Ethernet. Thank you for the ticket!!!! We check our volunteers in and give them a lunch ticket. The new machine makes it smooth sailing. Works well for what we need - printing meal tickets for our volunteers. 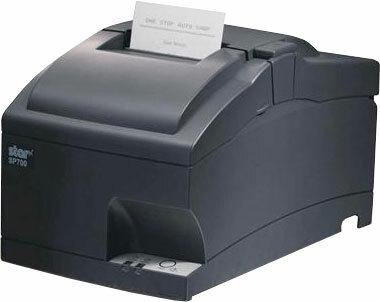 The Star 37999300 is also known as Star Micronics	STA-37999300	.